Over the years since the Constitution of the United States was developed, the power to govern has shifted away from American citizens because corporations have found ways to use the constitutional rights meant for humans to apply to their corporate entities. Corporations are created by people. They are not people. The voices of the people of the United States are being stifled by the power of these artificial entities which in many cases place profits over people. 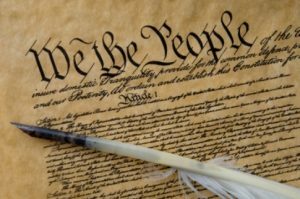 I fully support the “We the People” Amendment which would be the 28th Amendment to the U.S. Constitution. By reserving inalienable rights as outlined in the Constitution to the people of the United States only, power will return to the people. All corporate constitutional rights including the 1st, 4th, 5th, and 14th Amendments which have been acknowledged by Supreme Court rulings should be abolished. Numerous Supreme Court cases have ruled in favor of corporate “personhood” extending constitutional rights to them. Amongst these cases is the 2010 Citizen’s United Decision which ruled that political spending is a form of free speech and therefor, protected under the 1st Amendment. I do not agree with this ruling and do not agree that corporations should be extended constitutional rights. Money is not a form of speech, and corporate spending in elections should not be allowed to skew politics. Big corporations make contributions to both parties’ candidates, Republican and Democrat. This makes it difficult for 3rd party candidates. It also makes it difficult for citizens’ voices to be heard on issues important to them. Despite which party wins, the corporations end up winning. It is important that our government is not shaped by the special interests of these corporations. Corporations chase profits. The interests of the people of the United States regarding their personal and environmental health, desire for clean water, and the development of sustainable societies are not heard over these loud corporate voices that speak with money and claim constitutional rights. In addition to using 1st Amendment Free Speech rights to allow unlimited political contributions, corporations are also leaning on this amendment to protect them from not having to speak even in instances where it threatens public health such as not having to label GMOs. Big corporations are profiting at our expense. Look at the 4th Amendment Search and Seizure rights corporations are using. Violations of unlawful pollution and other hazards are being avoided by corporations, since warrants are needed under protection of this amendment. Under the 5th Amendment Double Jeopardy and Due Process rights, corporate “persons” seek compensation for projected profit loss in instances where environmental regulations are established out of protection. They claim these are “takings” of their property rights. Furthermore, they are using 14th Amendment Due Process and Equal Protection rights to expand and build against community’s desires and oppose policies favoring local businesses. These amendments which have been expanded to include corporate “persons” are taking away our power to self-govern and establish laws in our best interest. This needs to change. In the 8th Congressional District of Minnesota, we are experiencing many of the effects of what happens when corporate powers rise over the voice of our citizens and influence our democracy. The over-sea corporation Glencore, which has a reputation for human rights abuses and environmental degradation, seeks to expand its stranglehold on mineral resources right here in the northland. Glencore is the largest investor in the proposed PolyMet copper-nickel sulphide mine seeking permit to introduce this highly toxic form of mining into the fragile, water-rich ecosystem of northern Minnesota. The toxic effects of this proposed mine places corporate interests over the health of our communities. Despite 74% opposition by Minnesotans, the PolyMet proposal proceeds as political pressure to approve it is being placed on regulatory agencies and bills are being introduced attempting to bypass judicial review and ignore Minnesotan’s concerns. Should this mine be built, it would be the beginning of what could be a huge mining district and would inevitably lead to toxic pollution in the environment and water with mercury, arsenic, and lead. The costs will fall on our next generation and generations to follow. We are also in the final permitting of the Line 3 proposal by Enbridge, Canada’s 3rd largest corporation, which threatens the water-rich environment of northern Minnesota while progressing the fossil fuel industry. It is urgent to move away from fossil fuel usage and move towards sustainable technologies, addressing climate change. Still, the Minnesota Public Utilities Commission has approved a certificate of need for the Line 3 replacement and most of Enbridge’s preferred route has been approved. Recently, on April 26th, 2018, we had a disastrous fire at the Husky refinery in Superior, Wisconsin, destination for some of Enbridge’s oil. Most of the city was evacuated, and the toxic smoke plume fell to the ground. Along its path, people are advised not to come in contact with the sand or water for the next year. This includes gardening. Had the fire spread to the tank of hydrogen fluoride 200 feet away, the event would have been beyond catastrophic. We have the ability to move towards using renewable energy, create safe, sustainable jobs, and work towards eliminating the inequalities and disparities in our communities. However, our voices will not be heard without lifting the corporate powers that aim to suppress us. It’s important to break past the hold corporate America has on the United States to bring about the change needed to work towards global goals meeting world-wide issues. In 2015, UN Member States met to establish goals focused on creating a better future world-wide. The 17 Sustainable Development Goals which resulted were set to help guide countries’ policies towards sustainable development by 2030. Goals range from combatting climate change and reducing inequalities to transforming our planet with green energy. They also focus on addressing hunger, clean water access, and poverty amongst other target goals focused on well-being and sustainable development. In a recent assessment of how countries are doing with these targets, the United States came in #42. We need to honestly look at what holds us back from forming policies and laws that work towards achieving these goals. Goal # 13 calls for urgent action in combatting climate change. The Paris Agreement is essential in achieving this. On May 25th, 2017, Trump was urged to leave the Paris Agreement in a letter by 22 Republican senators. Donald Trump announced his decision to withdraw from the Paris Climate Agreement a week later. Reports say these senators’ campaigns have received over 10 million dollars from fossil fuel companies since 2012. The fossil fuel industries are benefiting with profits as climate regulations are lowered. The government’s decisions are being made in support of corporate interests. This is just one instance. Environmental protections are crashing down. Clean water, biodiversity, and our health is being gambled with as corporations and the wealthiest Americans aim to get richer. The judiciary shall not construe the spending of money to influence elections to be speech under the 1st Amendment. I believe wealth inequality is the greatest threat to life, liberty, and the pursuit of happiness in America. Currently, the richest 32.7 million Americans (10%) control 76% of the wealth in our country. Even more outrageous, 327,000 Americans, the richest .1%, control as much wealth as 294 million Americans (90%). We have 43 million Americans living in poverty. Those numbers are disproportionately women, children and our communities of color. Since 1963, the wealth of the richest 1% has increased seven fold. Coincidentally, in 1960, the highest tax rate was 91% now it is 39%, prior to the tax plan that was just passed by the Republican Congress. How many times must we implement a trickle down economy to find out once again that it does not work? There is no justification for a tax cut for the wealthiest 10%. With a moderate tax increase on the richest 10%, along with prioritizing our military expenditures, we could fund universal health care and free college for all Americans. Corporate greed and unfair trade deals like NAFTA have spurred the exodus of America’s core of manufacturing jobs out sourced to foreign countries. This has led to the stagnation and decline of workers’ wages and benefits here in the United States as American workers compete with substandard wages paid to workers in other countries. I will fight the job killing Trans Pacific Partnership trade deal to help strengthen and bring back our manufacturing and taconite mining jobs here in the 8th Congressional district. The tax plan that was just passed by the Republicans in congress will add trillions to our deficit. This debt will be passed on to our children and their children if we do not stop it. I will vote to repeal the tax plan that will take effect in 2019. There have been those in our government who have used the Social Security trust fund as if it is their personal slush account and stolen from it at the detriment of citizens who have worked their entire lives paying into it. This has the effect of making Social Security look under funded in order to call for raising the retirement age or the privatization of Social Security. I will fight the raid on the Social Security trust fund, eliminate the cap on wages that Social Security is paid on, lower retirement age and increase the cost of living adjustments. I will work for and support an amendment to the US Constitution to unequivocally state that inalienable rights belong exclusively to human beings. Money is not form of protected free speech protected under the first amendment and can be regulated for political campaigns. I truly believe this would return our government of the people back to the people of the United States of America. As a veteran, with two tours of duty in Vietnam, I have seen gun violence firsthand. I feel extremely saddened and outraged that there are 17 families in Florida who are now grieving their murdered loved ones. It is especially tragic that so many of these were just kids in high school with basically their whole lives in front of them. They lost their lives, the rest of us live in fear, and our pursuit of happiness is diminished by this loss. These mass shootings seem to be increasing in frequency and in size. We need to reduce that trend with the goal of ending them. There are many factors to consider, but the most obvious place to start is with the murderer’s weapons. The FBI now defines a mass shooting as one that has 3 or more victims (not including the shooters themselves). There have been 97 mass shootings in the last 35 years. A majority of the weapons involved in these mass shootings were semi-automatic handguns, most with high capacity magazines. However, many of the largest mass shootings lately have been done with “military style” assault rifles. Those modern long guns have very little recoil, are light, and easy to aim and shoot. Modified with a bump stock and larger magazines, they are extremely efficient killing machines. Mass shootings inspired Congress to pass a ban on the production of assault weapons in 1994. Included in the bill were several definitions of assault weapons including some for semi-automatic pistols and large capacity magazines. It also listed 650 weapons that Americans would still be able to buy with the ban in place. Unfortunately, the assault weapons ban had a sunset provision and expired in 2004. Efforts to reinstate a ban, have failed so far. Interestingly enough, of the 13 largest mass shootings in US History, only Columbine in 1999, (the lowest in size of those 13) happened while the assault weapons ban was in effect. Also, Columbine was the only one of the 13 done by two shooters, the rest had only one. Clearly, the assault weapons ban of 1994 had a positive effect to reduce the number and size of mass shootings. I fully support legislation to re-implement the provisions of the 1994 assault weapon ban. I also want us to strengthen it by grandfathering in the law-abiding current gun owners affected, but not allowing them to transfer ownership of the assault weapon. There should also be an offer from the Federal Government then to buy the weapon from the owner or their estate. Naturally, I will oppose a sunset provision on this legislation. I want to be clear, I will support the ownership of guns that people already own. In no way am I proposing or implying that we confiscate anyone’s guns. I also support reducing magazine capacity, closing the gun show loophole for all guns, implementing stricter permitting, longer wait periods, and stronger background checks with psychological evaluations for new gun owners after these bills becomes law. With this common sense legislation we will reduce suicides, and general gun violence, maybe even protect our police better. These regulations will protect not only everyone’s precious 2nd amendment rights, but also, protect everyone’s inalienable rights to life, liberty, and the pursuit of happiness. I challenge all 8th Congressional District Candidates to join me in making America safer by pledging to vote for some common sense gun reform by beginning with a ban on the production and sales of assault weapons. 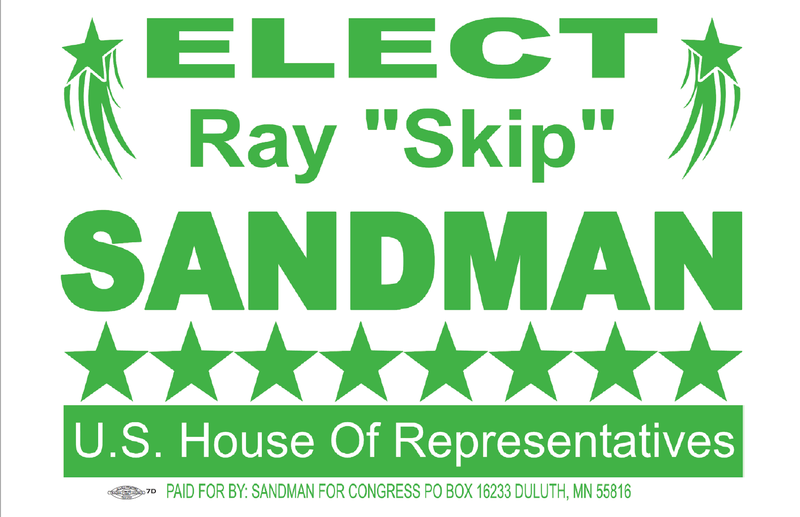 Elect Ray “Skip” Sandman to protect our water in the 8th Congressional District. I need your vote to help me protect our water, air, and environment here in Northern Minnesota. 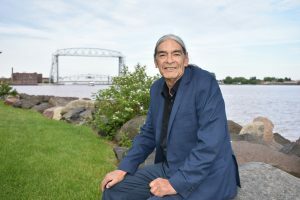 Rick Nolan has used his elected position, as our representative in Congress from the 8th District, to weaken environmental laws at the detriment of all of Minnesotans to benefit a few corporations. I will vote to strengthen and enforce environmental laws. Also, I will not lie to you about the toxic risks to our water from the copper-sulfide mines like Polymet. After I am elected, I will not grease the wheels for these industries who refuse to invest in technology that could increase our economy without endangering the life, we in northern Minnesota love. The risk of continued support of copper-sulfide mining is not what could happen to our waterways but rather what will happen. In spite of years of our many objections, PolyMet continues to move toward obtaining a permit to mine from the Minnesota Department of Natural Resources. This copper-sulfide company claims it will treat and build containment for all the toxins it produces, and that containment will last for hundreds of years. Containment will be expensive to maintain and will be abandoned eventually by PolyMet sometime after the mine closes, but before the toxins become neutralized. If the containment’s outdated design, a 250 foot tall earthen dam, is based on faulty water modeling, it will be nearly impossible to prevent catastrophic failure. Toxins like mercury, lead, and arsenic will work their way into our groundwater and down the St. Louis River to Lake Superior, putting thousands of people’s health and their livelihoods at risk. Polymet’s financial assurance is not sufficient in any scenario to cover a cleanup of toxins that may take as much as 500 years to correct itself. We simply cannot afford to trust PolyMet to do the right thing on its own. Plus, with the current political agenda in Washington, D.C., and another in St Paul, bent on eliminating environmental regulations and handcuffing enforcement agencies, there might not be anyone to force the company to do the right thing either. It is just better to not build the mine in the first place. I have been against this mine since day one. Originally, PolyMet’s business plan called for producing finished copper at a processing plant near Hoyt Lakes. Now their plan is to export the metal concentrates, resulting in 40 fewer jobs for Northeastern Minnesota. The refined metals likely would go to a foreign country like China to be manufactured into products there and shipped back to us and around the globe. I say those manufacturing jobs belong in Northeastern Minnesota to expand our tax base and our economy here. Why aren’t the copper proponents fighting for those jobs, too? If PolyMet is allowed to proceed, we could virtually be giving away our ore while taking on a grave environmental risk, all for the benefit of a few international oligarchs. This is a bad deal for Northeastern Minnesota and an outrage that we are even considering this. Education: The path to a just and sustainable society. I believe that equal access to a complete education is fundamental to a just and sustainable economy and environment. At a minimum, the first two years of college or technical school should be free to every American student. education The desire to extend one’s education on the college level should not be a financial burden. The United States has turned higher education into a profit center. Student loan debt in the United States is approximately 1.3 trillion dollars. It is the second leading form of debt in the country after mortgage debt. Upon completing a four-year degree, some American students are carrying in excess of $40,000 in debt. There are 45,000,000 overall student loan borrowers in the U.S. This accounts for 70% of college students. The average debt is $28,000 per student borrower. We are bankrupting young Americans before they even enter the work force, financially burdening students who return to college later in life, and holding back those who cannot afford to pay for higher education or risk the debt brought on by loans. This is not fair to our students, and it is not sustainable for America’s economy. The benefits of higher education are well documented. Economic growth, enhanced quality of life, personal well-being, and positive impacts on labor market outcomes are among these benefits. Those who have completed a college degree are also more likely to be civically engaged in their communities. So, how do we pay for this investment in a just and sustainable economy? Since businesses and corporations will flourish through the investments we make in our students, it is only reasonable that we begin by increasing taxes on those that will benefit the most–the wealthy. Back in the 1950s and 1960s, the wealthiest Americans paid a top income tax rate of 91%. The economy was booming. Now, the top rate is 39%, and the economy remains stagnant. With a moderate income tax increase on the richest 10%, along with prioritizing our military expenditures and eliminating corporate subsidies, the funding for free college for every American student will be available. We also need to take a look at the $1.3 trillion dollars that is being lost over the period of 10 years due to the lower rate of taxes on investment income. By taxing investment income at an equal rate to salaries, the total current student debt could be forgiven in 10 years. Think of how the economy would boom with that debt forgiven. We bailed out Wall Street in 2008, it is time we quit coddling the Wall Street Casino players and reward those students who are making the investments that will truly bring about a just and sustainable society. Free college would help build skilled workers in the fields of education, nursing, and other human services fields. It would also help fill middle skilled positions for welders, electricians, machinists, and other technical workers who require more than a high-school diploma. It would support people who chose to complete degrees in highly skilled occupations such as science, engineering and technology. Skilled workers would be a huge asset to the development of more sustainable communities focused on reducing carbon emissions and moving towards environmentally conscious choices in the United States. Specialized degrees will be in high demand. Workers who pursue them need a degree or certification and would also benefit by free college. Many of these positions do not currently pay enough to attract the numbers of workers that will be needed for these fields of employment. For example, there is a 20% projected growth rate in the field of substance abuse and behavioral disorder counselor jobs. The Bureau of Labor Statistics projects that 20,400 new counselor positions will be needed to fill this demand. By filling this demand through free college, other fields of employment would also directly benefit. The economic impact of the opioid epidemic is being felt cross country. Many companies are having difficulty filling open positions due to failed drug tests of potential employees. In some cases, companies report that at least 25% of potential employees fail their drug tests. I am running for 8th Congressional District Representative to give voice to what is best for our communities. The fact that the government is being driven by corporate greed has to change. Many who are in government positions are not leading us towards sustainability, because they are tied to the special interests that put them in office. Change needs to happen. It’s time for the United States to step up to providing the opportunity of free college to every aspiring student. Our willingness to fully educate all of our population will create a workforce that is best prepared for transition to a more just and sustainable society. Let’s talk about Healthcare in America. First, I think we can all agree that the healthcare system paid for by insurance is not working for the vast majority of the American people. For many of those that have health insurance it is expensive, high deductibles and co pays discourage using health care. 27 million Americans have almost no access to healthcare because they cannot afford the premiums. Our health care system is, however, working very well for the Insurance companies and health care administrators. 30% of our insurance premiums are skimmed off by insurance companies and provider networks for advertising, executive salaries, stockholder dividends and insurance billing. For example, if your annual premiums are $10,000 only $7000 goes for actual healthcare. Hospitals and clinics across the country are consolidating and increasing costs to patients in order to increase profit. (don’t be confused by the “not-for-profit” label some use. It’s all about the money). Profit also distorts the allocation of healthcare facilities in our country. If you have a rural community, access to healthcare is limited because there is no or too little profit to have facilities there. As long as healthcare is tied to profit, we will have a broken healthcare system. The United States health care system costs over $9,000 per person. Canada, which has a single- payer Health care system paid for by taxes to the government, only costs $4,500 per person. Yet, in spite of paying only half as much for healthcare, Canadians live 4 years longer than Americans! When we treat health care as a human right, the picture changes. Think Medicare. All citizens over the age of 65 have universal access to the healthcare they need. The insurance is a public “tax”, the healthcare is private run. It has been successful for decades and seniors have a sense of security because of this program. What is the barrier preventing the creation of a universal “Medicare for all”? It is insurance and drug companies who spend millions of dollars lobbying Congress and Citizens United allows them to contribute huge sums of money directly to Congressional campaigns. All of that money, buys a lot influence and is why the needs of the people are not met. A single-payer health care system is the beginning of the work toward a just and sustainable society. Health care is a human right! As your US Representative in Congress, I will not be bought, I will fight for single payer. One of my core beliefs is that everyone matters, that each life has value. As your representative in Congress, it will be my mission to work towards a more just society that protects everyone’s life, liberty and the pursuit of happiness. We can’t do this without making sure there is a roof over everyone’s heads. On any given night, over 500,000 Americans are homeless. Is this just, considering the massive wealth that some people in this country have? Is this moral, considering we spend 800 billion dollars a year on defense? And considering the enormous need to create jobs, does itmake sense that we are not addressing this issue? We need to decriminalize homelessness. The homeless are an invisible class of men, women and children who are just like the rest of us, but have fallen on hard times. We should not treat them as derelicts, vagrants and criminals any more than we would anyone living in homes or apartments in our nation. They need to have the rights the rest of us enjoy. They need help to get out of their homeless situation, which may also require treatment for addictions, mental health care and help navigating the systems in place that can help them. They need new laws that recognize their unique needs. When I am elected, I will vote for budgets that rebuilds the social safety net and introduce legislation that puts a roof over everyone’s head. In the meantime, I also encourage everyone to support their local homeless community by embracing ordinances that help the homeless instead of harassing them. 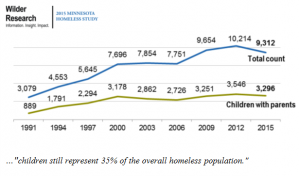 The City of Duluth has been considering a “Homeless Bill of Rights” over the last five years. The ordinance addresses the specific needs people have while they are homeless. Rights to simply exist as they live on our communities, Rights to prevent deaths in winter months. Things we take for granted. It’s time to take the “Homeless Bill of Rights” to a national level for enactment. The right to use and move freely in public spaces, without discrimination or arbitrary time limits. The right to rest in public spaces and protect oneself from elements in a non-obstructive manner. The right to eat, share or accept food in public spaces. The right to occupy a legally parked motor vehicle. The right to equal treatment by city staff and agencies. The right to protection from disclosure of personal information without consent. The right to protection from discrimination in housing and employment. The right to 24-hour access to basic hygiene facilities. I support the “Homeless Bill of Rights” and the humanitarian principles it embodies. To our veterans and their families, we stand WITH you always. This video was from the Tribute Fest in Duluth where my team and I volunteered over 150 hours in two days to support homeless veterans. I have spent many years working with addicts in a treatment setting and I am currently involved with Natives against Heroin. I have first-hand experience with our community’s struggle with addiction and the devastating effect opioids have on American society. When I enter office as 8th Congressional District Representative, I will be putting a priority on the war against opioids. 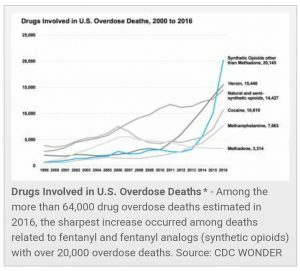 Sixty-four thousand Americans died from a drug-overdose in 2016 alone. 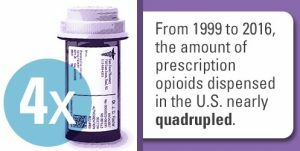 Forty-two thousand of those deaths were caused by opioids. In just that one year, more Americans were taken by overdose than by 17 years of the Vietnam War. Opioid addiction is now the leading cause of death in people under the age of 50. In order to wage a war on opioid abuse; we must first take an honest look at what causes the disease of addiction. Addiction is a disease that centers in the brain. Those afflicted with addiction needs to be treated as we would treat people with any other disease, in clinical settings. While I do not dismiss the fact that addicts’ behaviors inflict great harm on our communities, these behaviors need to be dealt with as a symptom of the disease. I have heard many experts liken addiction as an allergy to drugs and alcohol. What happens, when people with the disease of addiction use drugs and/or alcohol, is the brain’s survival instincts gets hijacked. The brain now believes that the way to survive the next few min is only possible with the drug. The addict will do whatever is necessary, as their brain is telling them, to survive. These behaviors bring crushing guilt and shame to addicts. Drug use, may then, also be used to numb the addict to these feelings as well. It is a vicious cycle for those afflicted with addiction. We have entire communities dealing with the problem of addiction and we need healing for entire communities. Imagine, if you will, a forest that use to be beautiful and green, but something is going wrong in that forest and the trees are getting sick and dying. So you take one of the trees, dig it up and move it to a new healthy place. You spend the time to take care of that tree and nurse it back to health. Then when that tree is again flourishing and healthy you dig it back up. You take it back to where you originally dug it up. You replant it back in the sick forest. Can you then be surprised when you begin to see the tree get sick again. Our communities are the sick forest. It does us no good to only treat individual addicts and send them back to places that are still sick. We need resources to go to entire communities to be able to solve our opioid problems. For far too long we have allowed the criminal justice system to deal with the problem of addiction and they have failed. It’s not the fault of that system and they are not equipped to deal with this problem any more than we would send diabetics into the criminal justice system to seek help for their disease. We have spent too much money and waisted too much time already. Addicts need to be treated as the sick people they are in treatment settings. Treating addiction in the treatment setting would save us more than half of what it would cost to incarcerate addicts. Pharmaceutical companies have devastated our communities with the introduction of opioids into the health care system. Four out of 5 heroin addictions start addiction to opioid prescription painkillers. Opioids are not the only way to treat chronic pain. They are being pushed by pharmaceutical companies, the insurance industry, and the medical establishment. To the detriment of our people, families and our society. Many alternative methods of addressing chronic pain are not even covered by insurance companies. We need to develop policies that will reduce the grip this epidemic has on our communities; incentivize alternatives in the health care system; fund research on treating the chronic pain that currently afflicts 100 million Americans, and find alternative options offered by single-payer health care programs. Opioids are carelessly prescribed. They are highly addictive substances. Their use is strongly correlated with future heroin addiction and they present an alarming risk of overdose. St. Louis County has the highest risk of overdose per capita of any county in this state. The spirit of addiction has taken hold in our families and among our friends and co-workers. We need to help the victims with a national plan for prevention and recovery and we need to hold Big Pharma responsible. As your Congressman, I will prioritize funding top-notch substance abuse programs focused on prevention, treatment, relapse prevention, and well-regulated Methadone treatment where Methadone is called for. We need to expand support for those struggling with addiction, meet their specific needs culturally and individually, provide funding for additional services, and make sure programs are assessable to all communities. It’s important that federal funds make it down to the grassroots movements—programs working side-by-side with people in the midst of addiction. It’s also essential to expand culturally specific programs and address disparities and social inequities in our communities. Compared to non-people of color, Native Americans are 5 times more likely to die of an overdose. African Americans are twice as likely. Intergenerational trauma and inequities in education, income, and employment feed the likeliness of addiction. By building up all of our communities in the spirit of equality and addressing the issues of historical trauma, we can help address some of these underlying issues. Our society is addicted—to punishment. Addiction is a disease. It is a public health issue. The stigma attached to chemical dependency needs to change, like the stigma of mental illness, the disease of addiction needs to be treated as a public health issue, affecting people of all ages, genders, races and socio-economic background. The shame and stigma must be lifted and we must openly embrace members of our community who are struggling. In Minnesota, instances of parental drug use accounted for in the removal of children from their homes rose from 14% in 2012 to 25% in 2016. It is now the most common reason for removal of children from their homes. Upon entering the system, the chances of parents losing their parental rights is high. Federal law sets a timeline for the parents to get clean and comply with court orders. We need to explore alternatives to arrest and incarceration. We need to expand programs that unite and heal families, rather than breaking them up, rather than feeding cycles of trauma. We need safe spaces where people can reach out for help with addiction, with no fear of criminal consequences and without losing their children. When I am elected as 8th Congressional District Representative, I will prioritize bettering our communities by continuing to fight the war on this opioid epidemic. It has been declared a national public health emergency, and it needs to be treated as one. The stands I take on the issues important to the 8th Congressional District lead the way towards communities better structured for well-being. Inequities and inequalities have always lead to instabilities in societies. Therefore, we need to get rid of the inequities and the inequalities that have led to disparities in our society. 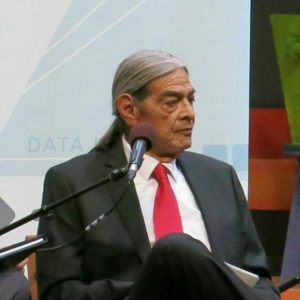 Early in my youth, I listened to my elders speak of looking seven generations into the future when deliberating actions that they might take and why it was paramount to our survival. Fortunately, enough of our native culture has survived that many elders, myself included, still strive to consider our actions far into the future. For at least a couple of decades most of us have been noticing the effects of global warming. Some of these are subtle changes in our ecosystems, in forestation, with some species of wildlife appearing where they were not before, and some species moving out. Most notably though, a series of incredibly powerful weather events right here in Northern Minnesota has shaken even the most fervent deniers into noticing that our climate is changing. 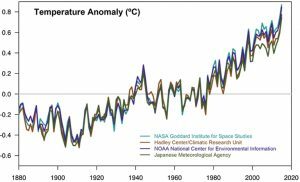 Global warming refers to the rise in average surface temperatures on Earth. Ninety-seven percent of climate scientists agree that global warming is caused primarily by the human use of fossil fuels, which releases carbon dioxide and other greenhouse gases into the air. Globally, these gases trap heat within the atmosphere, warming ocean temperatures, melting ice caps, thus creating rising sea levels and abnormal weather patterns. This intensifies severe weather events and creates droughts that lower our supply of clean water, affects agriculture, and makes landscapes more susceptible to wildfires. Worldwide, the fossil fuel industry is subsidized directly by government payments and indirectly with hidden subsidies caused by legislative ignorance and irresponsibility—subsidies that artificially hold down consumer costs of fossil fuel. Such subsidies amount to $5 trillion dollars each year and are equal to 6.5% of the global gross domestic product. We simply need to recognize that this $5 trillion subsidy is a corporate tax on the people and the planet. To begin the long process of reversing climate change, governments must mandate the use of green energy technologies. I will fight global warming with a two-pronged approach that both discourages fossil fuel use and incentivizes green energy investment. We need sweeping, near-term—not long-term—reduction of fossil fuel usage. For instance, individuals and businesses need to be encouraged to use less petroleum in their vehicles. Unfortunately, because the consumers’ price of a gallon of gas is artificially low, most drivers do not realize they are not paying for the true cost of driving. For example, the cost of maintaining our roads and bridges used to be met by gasoline taxes. Now, roads are either left in disrepair or are paid for by general fund taxes or by special local sales taxes dedicated for road work. This puts a burden on non-driving, lower-income individuals who rely on general fund taxes to pay for safety net programs. The Federal Gas Tax was last raised in 1993. An unrealistically low gasoline/road use tax discourages investment in ultra-efficient electric vehicles, mass transit, and light rail projects such as the Northern Lights Express. It increases pollution and global warming. For those reasons, I propose increasing the federal gas tax 5 cents per gallon per year. As part of this proposal, we should allow states to keep the tax money that they raise in their states for their roads and bridges. We need to put America back to work rebuilding our infrastructure. We need to incentive green energy usage. Thousands of Minnesotan jobs will follow. In addition, the fossil fuel industry itself is not paying for the full cost of production and transport of its products. Consider the carcinogenetic-laden tar sands replacement of Enbridge’s Pipeline #3, which runs across the 8 th Congressional District. What is Enbridge’s plan? To abandon Line 3 and leave it in the ground, where it will continue to contaminate the earth and water. The cost to dig this line up and safely remove it would be over a billion dollars. The project would create thousands of jobs. Removal would also force Enbridge to increase their prices, making investment in green energy technologies more attractive. Allowing Enbridge to leave Line 3 in the ground is tantamount to a subsidy. It represents tacit approval of policies that initiated climate change. It should not take an act of Congress to get pipeline companies to clean up after themselves, but if I am elected I will author legislation to make it happen. Let’s turn to the subject of electrical production. Currently, large monopolies control how electricity is created and distributed. Few individuals currently have the resources or expertise to generate solar or wind power. This keeps the electrical monopoly in charge. Often the monopoly will engage in limited solar and wind generation investment, but reverts to fossil fuels to generate the bulk of the power. Eighty percent of America’s electrical needs can be met by renewable sources. To accomplish this, we will also need to update the electrical grid and tie in energy storage solutions to take advantage of peaks in production and bridge periods of low production and high energy usage. As your congressman, I would call for and support a massive public investment in renewable energy and the electrical infrastructure to make it possible. Why aren’t we producing more electricity from renewables? Regulatory agencies such as the Public Utilities Commission allow companies such as Minnesota Power to charge consumers based upon the utilities cost to produce electricity. Power companies are not incentivized to invest in technology that will provide low-cost power; they make more money if their costs are high. Tragically, the true cost to consumers and society for the use of fossil fuels is seldom considered. We need to make sure that these monopolies work for the public interest and not just for their shareholders. In many communities across our nation, there are green energy advocacy and support groups willing to assist individuals and businesses. Congress can also encourage more conservation and green electrical production through rebates for more energy efficient homes and businesses. This may even result in a series of small decentralized green energy cooperatives, which may force the big monopolies to do the right thing. Reddy Kilowatt, look out! move toward a more just and sustainable future. As a person who has been taught to respect women and regard them as sacred, it is alarming to see the mentality on sexual assault being regarded as “boys will be boys.” This perspective evades responsibility of sexual abuse perpetrators for horrendous acts and minimizes the effect that the abuse has on victims of this sexual assault. This type of mentality is very unhealthy, and the way it is spreading throughout America is only creating a culture that accepts this abuse and will only perpetuate more abuse. We need to shift this back to the place where women are regarded with the respect they deserve and honored. Holding abusers accountable for their actions and centering our mainstream perspectives to that which deems sexual assault as inexcusable, something not to be brushed off, is important. In the vetting process of Judge Kavanaugh for his appointment to the Supreme Court, I feel that the two women who have accused him of sexual misconduct should have these accusations investigated by the FBI before any confirmation process happens. Every woman has the right to step forward and have her story heard. If they can hold Bill Cosby accountable for his past actions dating back 35 years, the Supreme Court nominee should also be investigated. I would like to call on Americans to examine their perspectives on how women are being treated to this day in 2018. It is a throwback into the past of selective male values. It’s appalling to me that certain men in 2018 still marginalize women as a whole.